After battling a supernatural sleeping sickness that early claimed two of their own, the Diviners have had enough of lies. They're more determined than ever to uncover the mystery behind their extraordinary powers, even as they face off against an all-new terror. Out on Ward's Island, far from the city's bustle, sits a mental hospital haunted by the lost souls of people long forgotten--ghosts who have unusual and dangerous ties to the man in the stovepipe hat, also known as the King of Crows.With terrible accounts of murder and possession flooding in from all over, and New York City on the verge of panic, the Diviners must band together and brave the sinister ghosts invading the asylum, a fight that will bring them fact-to-face with the King of Crows. But as the explosive secrets of the past come to light, loyalties and friendships will be tested, love will hang in the balance, and the Diviners will question all that they've ever known. All the while, malevolent forces gather from every corner in a battle for the very soul of a nation--a fight that could claim the Diviners themselves. Libba Bray is Queen when it comes to the supernatural as well as many other things too. The Diviners is a series that delivers a punch with every chapter. There is so much to unpack while reading the book that you do not want to rush through the story. However, what was different about this reading experience was that it was read to me. I have to be honest when I say that audio books are not my all time favorite as I do sometimes read much faster than the narrator can speak but for this book I am glad I had someone to slow me down. There was a lot more in this book that required me to really take in what I was reading and process things thru reflection. I would say that Libba Bray is subtle but I do not know if that entirely true. The Diviners gang is once more threatened by a supernatural force but this time their enemies are not the only things they are fighting. Can they come together or will their inner turmoils be the end of the Diviners as we know it. Bray has done a marvelous job over and over again transporting me to the 20's as I find myself once again in the speakeasies and this supernatural world that has been so craftily put together. I am once again amazed at how well a story can transport me to another time and place and allow me to follow the characters on an adventure. Libba Bray is Queen! There is so much love for this story and if you are a person that does not particularly like audio books, I would say give this series a chance. If not, then read this book if not the entire series. 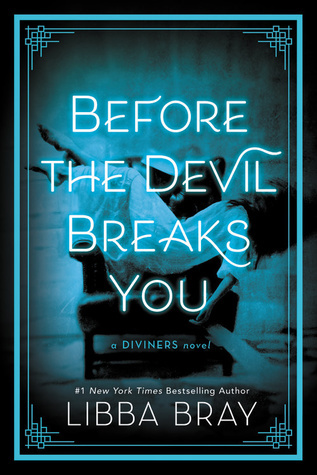 The Diviners will leave you wanting more and as you read you will begin to wonder if the devil will break you. Great review!!! I need to read this book yet!! !I loved the first 2! I'm a huge audio book fan and I also struggle with that I know I can read faster than the narrator, but I can listen when it'd be impossible for me to physically read a book. I have also found that I can speed up the narration if I listen via my library's app or Audible's app. I had to work my way up on the speed but now I listen to most books at 2x. Maybe give that a try?